When it comes to surviving a Minnesota winter, no Minnesotan would ever take having a working furnace for granted. But as many of us may have experienced, they seem to break down at the most inopportune times. You know, not when it’s 45 degrees out, but when it’s 30-below with wind chill. 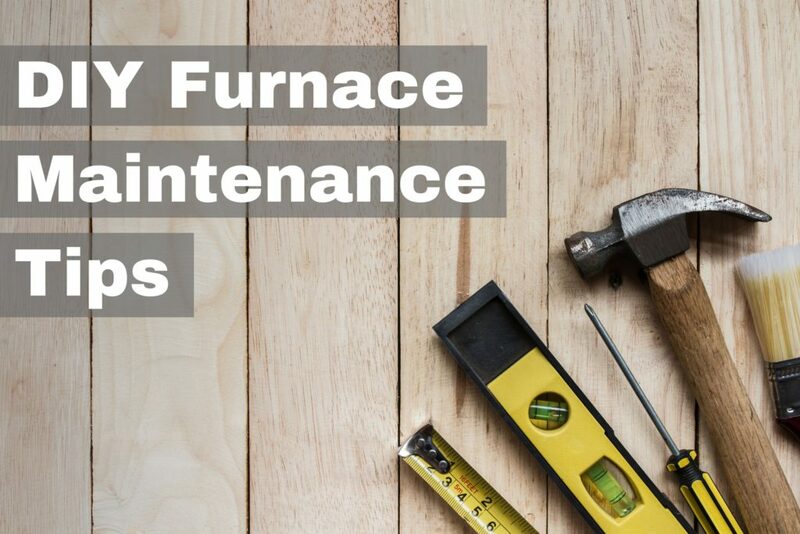 Yes, furnace repairs can sneak up on homeowners. But before you panic, there may be a few furnace maintenance and repair items you can take on yourself. With over 100 years of experience in furnace repair, installation, and maintenance, we have a few tricks up our sleeve when it comes to home heating systems. Below, we share our tricks of the trade that will help you keep your furnace running in tip-top shape. Below are some of our top DIY furnace maintenance tips that just may get your furnace tuned up—without calling in the professionals. Your furnace filter has a big job to do, and during months of high-use it can get pretty clogged up and dirty. A dirty furnace air filter can cause poor air flow and definitely doesn’t support good air quality. We recommend changing your air filter every month during high-usage times, but be sure to check the manufacturer’s recommendations as well. The burner flame is your furnace’s main heat source, igniting the gas as it comes through and pushing heat up into the heat exchanger. To check your furnace for potential leaks or dirt, you can check the color of your burner flames. Before you remove the combustion chamber door, make sure to turn the power off. Once inside, turn the power on, engage your thermostat, and check the flame color. Your burner flame should be burning evenly and blue. If the flame is yellow, that’s typically a sign of dirty burners, but it could also be a sign that your furnace is producing carbon monoxide. If you’re concerned about carbon monoxide, call a professional to take a look. Vacuuming your burners helps get rid of potential dirt and dust that can catch fire within the combustion chamber. You’ll need a 20” length of ½” drain line connected to your vacuum hose to reach behind the burners. Get started by turning off your furnace system, as well as the gas supply, and then vacuum any dust in or near the burners, blower compartment, or furnace base. The blower is a device that actually moves the furnace’s hot air through your ducts and vents. Keeping your blower clean is critical for helping air circulate throughout your home. Unscrew the blower and remove it from the unit. Clean the blower blades with a vacuum and small brush, but be careful not to disturb the counterweights or wiring. Before moving on, you should also check your blower’s drive belt. Belt-driven blower belts need occasional replacement if they become worn, frayed, or cracked. Give yours a regular once-over to see that it’s in good shape. If a replacement is needed, you can purchase one for about $5. The flame sensor is an important piece of equipment in your furnace, telling the system when the gas valve is open and a flame is actually present. The sensor is a simple device in the burner assembly that looks like thin, bent metal rod that sits in front of the flame stream. Remove the flame sensor by disengaging it from its bracket, then gently wipe it down. We suggest using a fine emery cloth made to clean metal surfaces. Without a pilot light, a continuously burning flame, your furnace will fail to turn on and ignite. The hot surface igniter is the device that uses the pilot light to ignite the furnace. Keeping these two devices clean ensures that your furnace can cycle on and off without issue. To guard against a dirty pilot causing a false reading that the pilot isn’t lit, we suggest using a drinking straw to blow off any dust that may have built up on the pilot or the hot surface igniter. Note: do not touch the hot surface igniter. Many furnace systems have motor bearings and blower shaft bearings that should be lubricated yearly with just a few drops of lightweight motor oil. Not only will this keep your blower and other furnace parts operating smoothly, but it will also help prevent the natural wear and tear that comes with heavy furnace use. Unlike a fine wine, furnaces tend to get worse with age. One of the key indicators of an aging furnace that could be in need of some repairs is corrosion. Look for a white, powdery substance on an exhaust vents as this could be a sign of corrosion. A professional can make any necessary repairs here. While inspecting your furnace, it’s also important to inspect the vents and ductwork that distribute the warm air into your home. If during your vent inspection you noticed a leak, use metal tape or heat resistant silicone to seal them up. One of the key components to any furnace is oxygen. The air intake pipe is the part of your furnace that introduces oxygen into the combustion chamber, while the exhaust pipe rids your furnace’s harmful emissions from your home. Both pipes typically rest on the roof or side of your home’s exterior. If the air intake or exhaust pipes are blocked, your furnace is likely not running properly and may allow harmful fumes to enter your home. Be sure to clear away debris such as snow, ice, or leaves from exterior furnace exhausts to keep your home’s air safe. Because furnaces are often installed in hidden away areas, you will need to perform furnace cleaning regularly to avoid dangerous build up. This includes performing those cleaning tasks we mentioned above for your blower, pilot light, burner, and other key furnace components. To identify other furnace parts that might need cleaning, look inside your furnace to see if there is dirt, rust, or accumulated grime. Use a brush, a cloth dipped in a mild detergent, or a vacuum to remove the dirt. Be careful not to use any flammable cleaner, such as a solvent derived from petroleum products during furnace maintenance, since leftover residue could catch on fire. Then wipe it clean on the outside. Before heat is dispersed into your home, the warm air first needs to pass through your many vents and ductwork. If your vents or ducts are in need of cleaning, warm air could be blocked from entering several rooms. Make sure your vents and ducts are unobstructed by vacuuming the dirt or dust in or around the vents and double check that they’re open. In addition, check to make sure that your ductwork is not torn, disconnected, or tangled. Your thermostat is one of the most powerful tools for keeping your furnace in check and regulates the temperature for your whole home. If you own a mechanical unit, make certain that it’s level. If it’s an older device, consider replacing it with a WiFi enabled thermostat. This could give you immediate savings on your heating bill. If you already have a digital thermostat, make sure that it is working properly and replace the batteries if needed. One of the best ways to extend the life of your furnace, is to schedule annual maintenance from furnace maintenance and repair experts. Annual inspections are a low-cost and preventative measure that can make sure your furnace is running in peak condition. If your furnace is acting strange even after performing all of the maintenance steps above, it’s time to play detective to figure out what’s wrong. Before you can diagnose any problems with your furnace, you must first know what type of furnace you have. The three most common types of heaters are heat pumps, furnaces, and boilers. Boilers heat water that flows through pipes to the radiators in your home. Furnaces heat metals coils and use a motorized blower to blow air across the coils and through ductwork to heat your home. This is also called “forced air” heating. Heat pumps use electricity to move heat from a warm room to a cool room. If your heater uses electricity, the first place you should check in the case of a heating problem is your home’s breaker box or fuse box. If you see a flipped breaker or a blown fuse, simply flip the breaker back or replace the fuse and see if that fixes the problem. If it doesn’t, call us to schedule a visit. If there are no problems with your electricity, the next thing you check should be your thermostat. Oftentimes, people will change the thermostat without realizing it, and this can cause a change in heating. If your thermostat settings look normal, check your heater’s air filter. As previously mentioned, a clean air filter is necessary for good airflow and air quality and should be replaced once a month during periods of high use. Unless you have electrostatic filters, you should be able to easily change them yourself and see improved performance. Making loud noises while operating. If your furnace flame is yellow instead of blue. If you’re in need of a professional furnace repair company, we’re here to serve. We offer 24/7 emergency furnace repair during Minnesota’s harsh and long winter months, so call us anytime for help. Thanks for these great tips! I just moved into a new house and have been trying to make sure it’s all prepped and ready for winter. I definitely want to make sure my furnace is working properly, and my repairman has already suggested a few parts that could stand to be replaced. Once that’s done, I’ll make sure to keep up on maintenance like changing the filter every three months this winter like you suggested! I like that you mention things like to check your burner flames, or to lubricate the bearings. This made me realize that I should definitely call a professional because I have no clue what or where any of these things are. I will look for some technicians tomorrow!